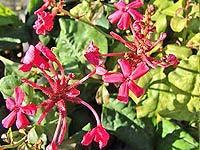 Common Name : Fire Plant, Rosy-flowered Leadwort. Habitat : Throughout india in moist situations and also cultivated. Uses : Root is said to increase the digestive power and promote appetite. It is a powerful irritant and has well marked antiseptic properties. A liniment made from bruised root mixed with a little bland oil is used as a rubefacient in rheumatism, paralytic affections, in enlarged glands, buboes etc. This herb cures certain cases of leucoderma. It is also useful for other skin diseases and for scorpion-sting. Scraped root is introduced into the mouth of the womb to procure illegal abortion. A tincture of the root is used in secondary syphilis, in leprosy and also in dyspepsia, piles, flatulence, loss of appetite and other digestive complaints. It is a good remedy to check post partum hemorrhage. The milky juice of the plant is used in ophthalmia and in scabies. It is an antiseptic, and is also useful in the management of skin disorders, rheumatism, and mental disorders.